The Data Collection module for Focal*Point provides a method to quickly and accurately gather inspection probe data from machine controls and store the information for later quality review and permanent archiving. The Data Collection module should not be confused with the more robust implementation of Machine Event Monitoring (MEM) as described elsewhere on this site. Where MEM provides an opportunity to gather, record and report almost any machine event for gauging overall machine efficiency, the Data Collection module takes a simpler approach by capturing DPRNT statements during or after machine operations. In general, most users are perfectly happy to output probe inspection results to data files rather than the more archaic method of printing to an attached printer and then storing the accumulated reams of paper in a usually bloated file cabinet. Although this is the most common practice for data collection, it is certainly not the only reason for capturing DPRNT statements. Focal*Point’s standard collection method captures either a continuous or a segmented stream of data and stores the information to disk files as specified by user setup options. What is not immediately evident is that by strategically adding macro calls within your program code, it is also possible to record inspection data relative to part drawings and tolerance values. For instance, consider the following example using the segmented capture option with DPRNT statements. The initial report header contains the part number, the operation and a serial number that is incremented using a macro variable. As you can see, well-placed macro calls allow you to customize inspection reports and record the results in name specific, text files. In the example above a file is created in the K:\transfer folder using the name SL999_123_-105 <date and time stamp>.txt, which contains all of the above part and serial number information, plus drawing references, tolerances, and the actual measured value . This report is then available to inspection personnel who quickly and easily compare the measured values with tolerance values specified in the blue print drawing. 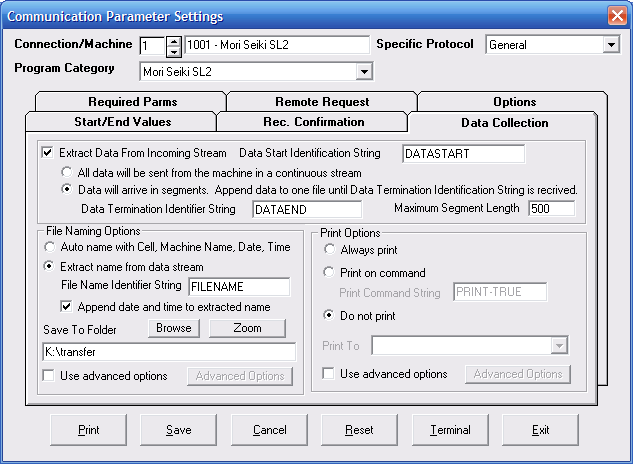 Taken a step further, for controls capable of outputting a variable containing the current time stamp, the DPRNT statement can be used at specific machine events such as Cycle Start, Spindle ON and OFF and Tool Changes etc..
For a free trial of the Data Collection feature simply activate the 10-Day option that is accessed within Focal*Point’s Help menu under the section labeled Manage My License.